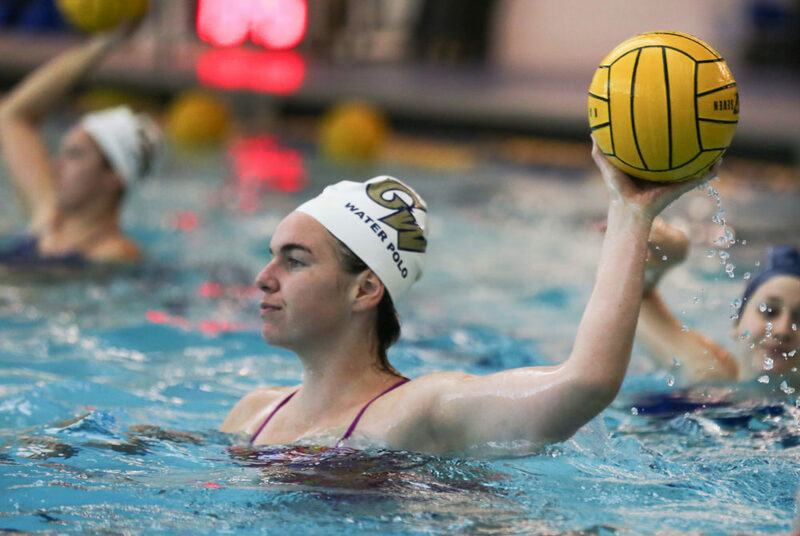 Senior utility player Scarlett Hallahan throws the ball at a women's water polo practice earlier in April. Women’s water polo finished in eighth place after three days of play in the Collegiate Water Polo Association Championship last weekend at Bucknell’s Kinney Natatorium in Lewisburg, Pa. The Colonials (14-16, 3-5 CWPA) – the No. 6 seed in the tournament – dropped their first game 13-9 against No. 3 seed Hartwick Friday afternoon. GW lost to No. 7 Brown 9-3 Saturday afternoon before picking up a 12-6 victory over No. 9 Saint Francis Saturday night. The next morning, the Colonials fell to No. 23 Harvard 10-2 in GW’s final game of the tournament. The weekend wraps up a roller coaster season for the Colonials. GW won four of its first five games of the year but could not string together more than two wins in a row through the rest of the season. A five-game losing streak in the middle of the season included three-straight losses to CWPA opponents. The Colonials notched wins against No. 23 Harvard and Brown – opponents they had not beaten in years – two weeks before the tournament. Nine different Colonials found the back of the net during the tournament, and sophomore goalkeeper Samantha Runyon tallied 24 saves. Freshman utility player Alana Ponce tallied six goals in the tournament to lead the Colonials in scoring. The team recorded one more win at the conference tournament than they did last year, when the Colonials dropped three games in a row to end their championship bid. The Colonials were unable to hold back a strong Hartwick offense Friday afternoon, dropping their first game of the tournament 13-9. GW held Hartwick to seven less goals than what the Hawks previously scored against the Colonials earlier this month. The Colonials were paced by senior utility player Scarlett Hallahan, who picked up three goals in the match. Senior attack Jacqueline Bywater tallied two goals and two steals, while freshman attack Grace Heck made one goal, dished out two assists and collected a team-high five steals. The squad fell back 4-0 against Hartwick in the first frame and played from behind for the remainder of the contest. A goal from Hallahan edged the Colonials closer to the Hawks’ 7-4 lead with less than two minutes left in the second quarter, but Hartwick answered back with a goal of its own to enter the break, leading 8-4. The team held Hartwick to five goals in the second half while picking up five of their own, but the Colonials were unable to overcome the Hawks’ early lead. Brown’s defense smothered GW, holding the Colonials scoreless through two quarters in their 9-3 loss to the Bears Saturday afternoon. The Colonials could not get the ball past Brown senior goalkeeper Marisol Dakan, who made 13 saves in the match. Ponce, sophomore center Emma Shaffer and freshman center Katherine Atherton each found the back of the net once in the match. A goal by Ponce in the opening minutes of the first quarter tied the game at one, but the Bears scored three unanswered goals to head into the second frame leading 4-1. GW did not score again until the fourth quarter, while Brown tallied a combined eight unanswered goals in the second, third and fourth frames. The team’s final pair of goals came from Shaffer and Atherton in the last two minutes of the game. The Red Flash went scoreless in the first quarter and trailed the Colonials for the rest of the game in GW’s 12-6 win over Saint Francis Saturday evening. The Colonials’ offense picked up three goals in each frame in their first win of the tournament. In the regular season, GW had already beat the Red Flash three times. “The ability to kind of get right with playing against a team that we had shown to be better than already was valuable at that moment,” King said. The Colonials jumped to a 4-0 lead after senior center defender Maggie Ball found the back of the net less than two minutes into the second quarter. GW picked up two more goals while conceding two to enter halftime leading 6-2. After three quarters of play, the Red Flash got within five of GW’s 9-4 lead, but the Colonials offense continued to produce. Freshman utility player Jaleh Moaddeli picked up a goal with less than five minutes remaining in the game to give the Colonials a 12-5 advantage. Ponce led the team with three goals in the game, followed by two goals each from Moaddeli, Bywater and fellow senior utility Erin McGeoy. After defeating the Crimson 14-12 earlier this month, the Colonials fell to Harvard in their third meeting of the year 10-2 in the tournament’s seventh-place game Sunday morning. Ponce and Bywater tallied the team’s only two goals and Ball snagged a team-high four steals in the match. The game was the last game for the team’s seven seniors, and King said “there was some weight” knowing it would be the last contest for them. The Colonials again had a hard time finding the back of the cage against Harvard senior goalkeeper Cleo Harrington, who collected 13 saves in the game. “Even though we were building good opportunities, we just couldn’t put it in the back of the cage,” King said. The Colonials entered halftime down 7-0 and did not find the back of the net until the third quarter. The Crimson racked up their final three goals in the third frame before going on a scoring drought in the fourth quarter.